Home Car News Tech What is rear-wheel steering? And how does it work? Measuring a whopping 5789mm (that’s 19ft) from bumper to shiny bumper, Ford’s new F-150 Platinum is big enough to require planning permission if I wanted to park it in my village. To put it into perspective, the latest Ford Fiesta is nearly 1800mm (6ft) shorter. If the F-150’s length isn’t daunting enough then its 3583mm (12ft) wheelbase and 13.7m (45ft) turning circle multiplies every three-point turn by a factor of 11. That could be deeply inconvenient unless you live somewhere as spacious as Texas. Increasingly, though, pick-ups like the F-150 are finding favour with urbanites eager to discover their inner plaid shirt and Cat boots, despite the difficulties of manoeuvring such a large vehicle. Which is where ZF’s rear-wheel steering technology comes into play. We’re already familiar with it on Porsche’s 911 Turbo and the Ferrari F12 where the electro-hydraulic systems move the rear wheels by as little as ±3° to improve cornering, lane change response and stability. But on a pick-up? The ZF tech articulates the rear wheels by up to 12° but can use just 3° to enhance straight-line stability. 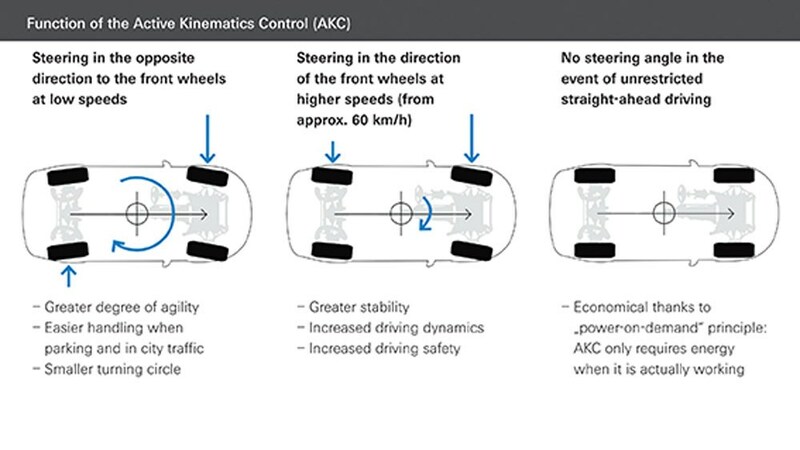 ZF’s Integral Chassis Control (ICC) connects the belt-driven power steering (EPS) on the front axle to the rear-wheel-steer system. The turning circle is reduced to a Kuga-like 11.5m (38ft). Up to 22mph the front and rear wheels oppose each other so the vehicle pivots around its centre point, after which it disengages until 34mph when it switches back on (but with front and back steering the same way) to balance lane-changes. An added benefit, which is still under development, is countering trailer sway by altering the angle of the rear wheels to control wobbly caravan moments, allowing manufacturers, it’s claimed, to increase a vehicle’s towing capacity. This might all appear a little esoteric for car buyers unfamiliar with F-150s, but rear-wheel steering is a technology likely to become increasingly popular. ZF also demonstrated a long-wheelbase BMW 740 with a version of the gear used by Porsche and Ferrari but with a single actuator to reduce costs. With ±3° of rear steering it shaved 0.6m from the 12.9m turning circle as well as improving slalom speed and stability. Yes. The F-150 might be an extreme example of rear-wheel steering but it is impressive. Trying to reverse the bulky pick-up out of a tight parking place without skittling cones entailed endless shuffling back and forth, constantly nibbling at the steering which, although power-assisted, was tiring. 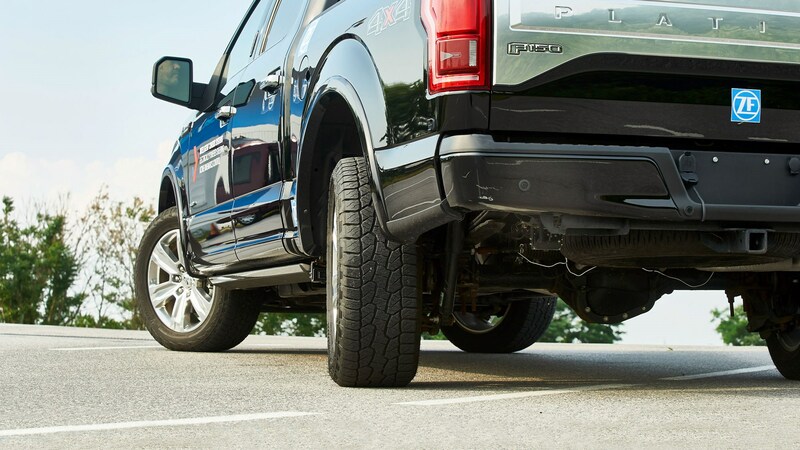 Switching on the rear-wheel steering transformed the F-150 into a much more agile performer. Now, where’s that planning application?